The rooms were pretty and comfortable, and had been decorated in an intimate and cosy Victorian style to stay in keeping with the look of the hotel. 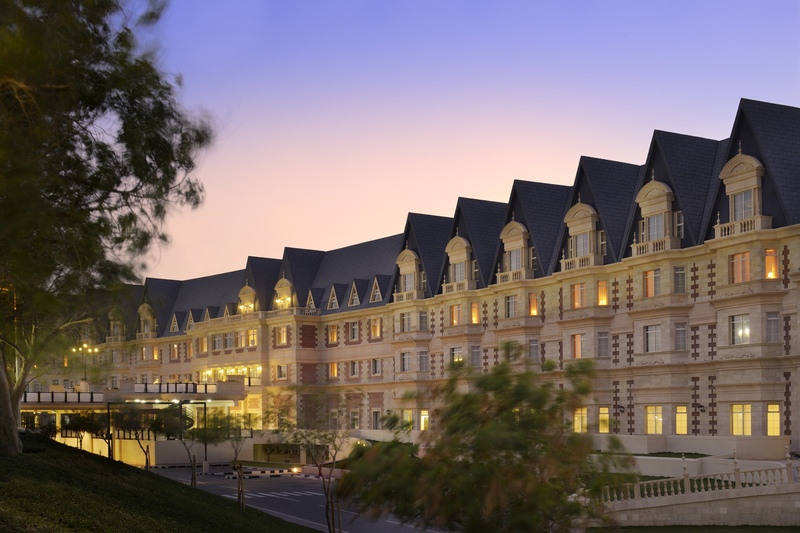 Room rates were fairly reasonable and started about 599QAR (about £110), and so The Grand Heritage Hotel is ideal if you are looking for a pleasant, relaxed and comfortable sleep at an affordable price. But regardless of whether you decide to stay at the Grand Heritage Hotel or not, a visit to the hotel is worth considering for the food at their restaurant, Blue Retaurant. Ranked as one of the ten top restaurants in Doha on Tripadvisor (at the time this post was published), the menu at Blue was unusual in that it served both sushi and steak and so it was neither a conventional steakhouse nor a Japanese restaurant. The décor was fine although the ambience felt a little serene. The menus were fun to peruse however as they were all on iPads, so you could spend oodles of time just browsing your way through the various options available including maki rolls, nigiri, steaks, pastas and other main dishes. It is worth noting that the restaurant is dry so no alcohol is served, but Blue serves a delicious range of mocktails. We tried a broad range of maki rolls from the menu, all of which were delicious, including the Hometown Californian roll (3 pieces 50QAR – about £8.80) which consisted of a delicious combination of deep fried Alaskan crabmeat, avocado and cucumber rolled with tobiko, mayonnaise and eel sauce. Hot scallop maki (3 pieces 45QAR – about £8) was scrumptious for the beautifully crumbed, sweet scallop perched on top of a roll of crabstick, avocado, cucumber and black sesame seeds. To complete the maki was some salmon roe for a light touch of saltiness and finely chopped spring onions for some oniony notes. The crispy shrimp maki (3 pieces 40QAR – about £7) consisted of Roman Lettuce and avocado rolled with sesame seeds and tobiko. The shrimp was firm, tasty and sweet, and the roll had been finished with a tasty spicy sauce for a thrilling little kick. A crunchy crabmeat maki (3 pieces 40QAR – about £7) was interesting for the use of crabstick and avocado rolled in tempura crisps. Tasting like puffed rice, standard sushi rice would have probably worked better than the crisps. Finally some nigiri selections of salmon and shrimp were delectable and fresh. 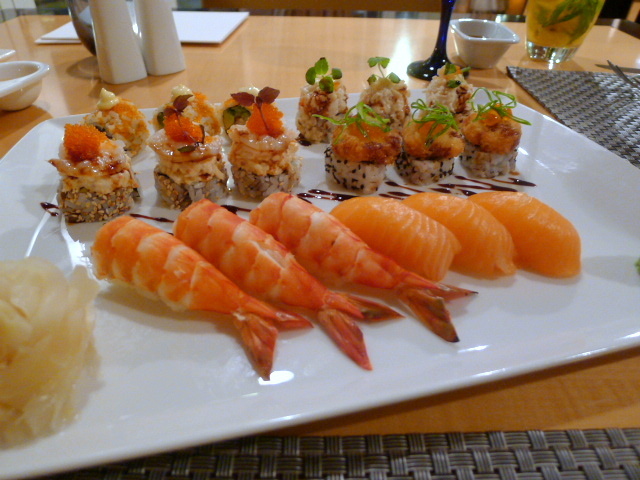 Like the rice used in the maki rolls, the rice here was perfectly made and well-judged for acidity and sweetness. 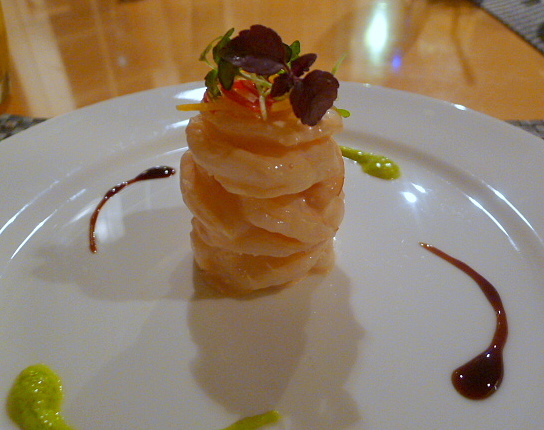 A starter portion of shrimp cocktail in a thousand island cocktail dressing with avocado puree and balsamic reduction (49QAR – about £8.60) was delicious. Unlike some traditional cocktail dressings, this version was light and creamy and did not overpower the sweet taste of the yummy shrimp. 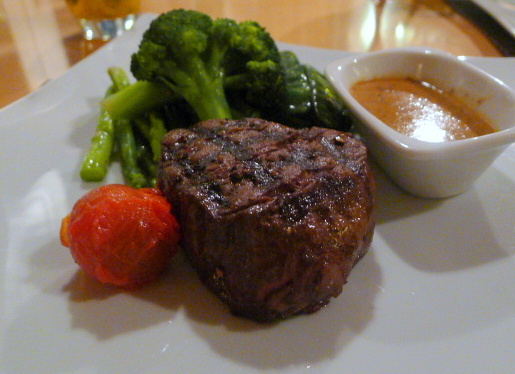 160 grams of U.S. prime beef fillet (180QAR – about £31.70) was perfectly cooked to the requested medium rare, beautifully seasoned, rich with flavour and incredibly tender and juicy. It was a wonderful, delectable piece of meat. Served with a choice of sauces, the mushroom sauce that I selected tasted like packet stuff and was none too great. That said, the quality of the steak was superb and needed no sauce. A choice of sides also came with the steak and the steamed vegetable option included a mixture of beans, mangetout, broccoli and asparagus. All the vegetables had been precisely cooked to yield a good crunchy bite, were well-seasoned and dressed with a drizzling of delicious butter. 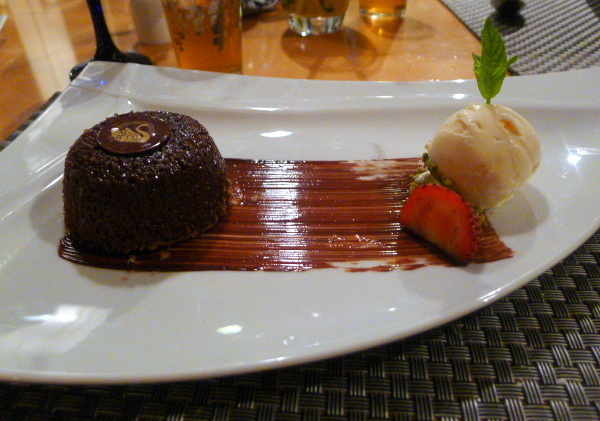 A chocolate fondant with vanilla ice cream (38QAR – about £6.70) had a good flavour but was cooked at too high a temperature. The result was a centre that was much too set, with the only bit of runniness at its very core. The bottom of the dessert was also a little too dry. Nevertheless, it was still yummy, and with some tweaking, the fondant would have spot on. The service at Blue was personal and friendly and there was a genuine attentiveness to it that showed that the staff really cared for our comfort. And the food spoke volumes as it was excellent. Alcohol or no alcohol, this restaurant was worth visiting for the food alone.